Stonewall Gazette: Gay ally, 10 year-old Will Phillips, needs our help! Gay ally, 10 year-old Will Phillips, needs our help! 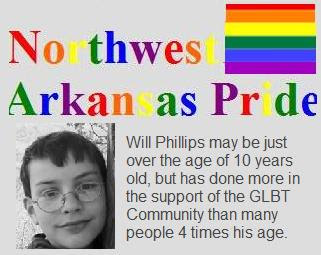 With the full backing of his parents, ten-year-old Will Phillips was named as the Grand Marshall of the North West Arkansas Pride Parade in Fayetteville, Arkansas. Phillips, you may recall, is one of the youngest people ever in America to take such a public stand for equality by refusing to pledge allegiance to a country that discriminates against gays. Unfortunately, the anti-gay American Family Association has decided to rain on everyone's parade by issuing an action alert demanding Fayetteville's mayor, Lionel Jordan, pull his proclamation supporting the event. The AFA condemns the event and calls it "[a] homosexual event exploiting children for deviant sexual approval." Fayetteville's mayor, Lionel Jordan, has already received hundreds of anti-gay emails! My buddy Michael Jensen (editor at Afterelton.com) has taken a great step to counter this wrongdoing by the AFA. Michael suggests that we all proudly voice our support for Will Phillips! You too can participate by spreading the word - TEXT IT! BLOG IT! TWEET IT! Our gay ally, 10 year-old Will Phillips, needs your help!